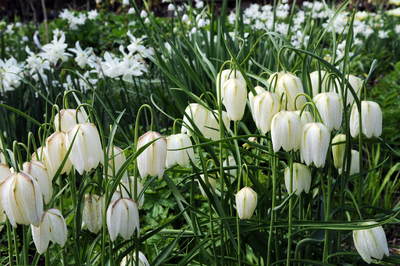 The snakeshead fritillary is a very frustrating plant. For those who have a garden which meets its very specific conditions it will produce masses of healthy seedlings; those who don’t will watch the bulbs they have planted dwindle and die. There are no half-measures: if you don’t have cool damp soil (or, ideally, a flood meadow) you can’t grow it. But what a joy when the plant is happy! The species has dark purple flowers on the top of 25cm tall, slender stems but is at its best when planted along with the diaphanous white form. Each benefits from the other and together they sparkle.